Coming to the end of his term, on Friday 22nd May 2015, the Mayor of Dartford Avtar Sandhu MBE held his Dartford Mayor Fundraising cheque presentations for his 31 different charities, groups and organisations for whom he had been raising money for over the past year. The evening, which took place at Dartford Working Mens Club, was attended by around 20 of the charities who all received their share of the fundraising total. 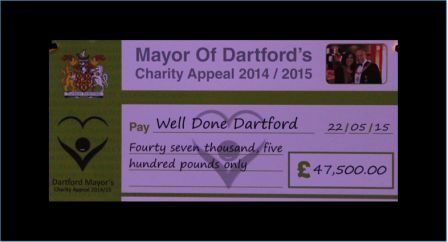 The fundraising total at the time of the cheque presentation was £48,500 which the Mayor of Dartford had raised through a range of activities including a sky dive, band nights and clay pigeon shooting. 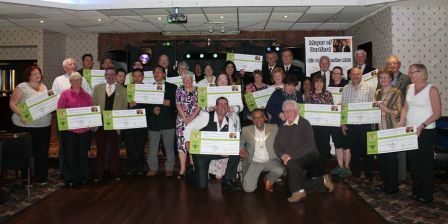 Many of the charities who receive their cheques on the night took the time to comment on the hard work and dedication the Mayor Avtar Sandhu has put into Dartford and the community. The groups which attended ranged from DAODS to the Lions Club with others being unable to attend but will receive their cheques soon. As well as the presentations, the night also consisted of a full buffet and live entertainment in the form of a local Dartford DJ. The Mayor of Dartford's term ends on Wednesday 27th May 2015. To find out more, contact us.